@TheCheckdown / TwitterThe Chicago Bears came within inches of pulling one of the most miraculous comebacks in recent memory against the Patriots. After forcing a Patriots punt late in the fourth, the Bears got the ball back at their 20-yard line, down a touchdown with just 24 seconds left in the game. Mitch Trubisky found several receivers on quick out routes to move the Bears offence up towards midfield with two seconds left, setting up Chicago for one final heave to the end zone. Receiver Kevin White came down with the ball in traffic and attempted to push for the goal line, only to be met by a Patriots defence that was determined to bend, not break. White was called short of the touchdown on the field, and once the ruling was confirmed upstairs, the game was officially over. 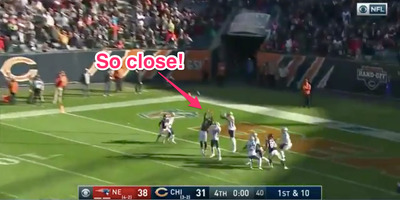 The Patriots had survived the Bears’ potential comeback by a matter of inches.